Everyday painstaking pride goes into our "Sanuki Noodles". You can savor the combination of Sanuki Noodle made from domestic wheat and Kansai-style soup made every day using bonito and kelp. 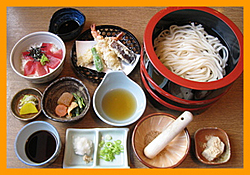 In addition, we are offering Japanese food using seasonal foodstuffs.